The Wolfgang Uber Rinseless Wash In-A-Bucket Kit is the perfect introduction into the world of rinseless car washes! This kit contains everything—including the basic 5 gallon bucket equipped with a Grit Guard, the best rinseless wash mitt, and the perfect drying towel to get the job done. But no rinseless wash kit would be complete without the best rinseless wash, and Wolfgang Uber Rinseless wash is just that! It contains all of the cleaning power and lubrication you need to keep your vehicle shiny an clean virtually anywhere. 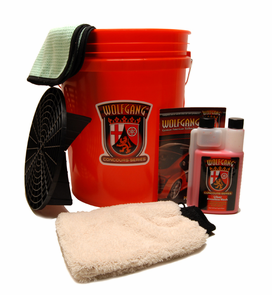 The Wolfgang Uber Rinseless Wash In-A-Bucket Kit is the perfect combination for upping your rinseless wash game! Wolfgang Uber Rinseless Wash is the ultimate rinseless wash formula offering maximum lubrication and cleaning power without the waste. This highly concentrated formula is thick and slick, providing a safe way to remove road grime without scratching delicate paint. Wolfgang Uber Rinseless Wash will quickly become your favorite alternative to traditional car washing methods! The Ultra Soft Microfiber Rinseless Wash Mitt is specifically designed for use with your favorite rinseless wash formulas. This mitt features hundreds of long, sot fibers that grab dirt and pull it away from the paint. The Ultra Soft Microfiber Rinseless Wash Mitt helps you ensure that or vehicle gets clean even during foul weather or in areas with water restrictions where a rinseless wash is an absolutely essential part of your vehicle maintenance routine! The Supreme Guzzler Waffle Weave Drying Towel features a plush, 80/20 waffle weave that increases its surface area for greater moisture absorption. The towel can absorb 7 times its own weight in water! The Supreme Guzzler Waffle Weave Drying Towel measures 20” x 40”.That's 5 1/2 square feet of plush fabric! It's a terrific drying towel for any size vehicle. This kit has a total retail value of $83.94 saving you $33.95! I feel it was a good value for some quality essential products that you just can't have too many of plus the Wolfgang Rinseless Wash. This kit got me started with rinseless washing. Excellent value. I was afraid to try rinseless washes when I started detailing because I was used to the old way of doing things. Because of the price of this kit, I took the plunge and I'll never look back. Rinseless is so easy, I often prefer it over normal washes even in the summer time and even though I have hose access. The process is quicker, there's less chance for water spots, and its better for the environment. Uber Rinseless is a mainstay in my collection because it can be used for waterless wash, QD, clay lube and water conditioner when I do normal washes. The mitt is awesome for rinseless washes as well. ProsPrice. Versatility of Uber RW. The mitt is soft and I haven't seen any swirls from it, even when doing RW on a fairly dirty car.